This salad is terrific on a hot summer day and is so simple, refreshing and unusual that's it's absolutely delightful. It's another riff on something we had recently in a terrific New York restaurant and is my own variation and improvisation on a Malaysian salad. Here is my "Pickled Watermelon and Scallion Salad". Many people don't like pickles or the concept of anything that is pickled. I can understand that, as just last night I ate a dish that was completely overwhelmed by vinegar and totally ruined the food. I promise, this is a very gentle and subtle pickling, it's not even tart so much as crunchy and bright. I used a sweet Japanese cooking wine, to keep it from being too tart. This is a great dish to make when your watermelon is a day past perfectly ripe; it helps revive the juicy crunch if it's edging toward softness. Easy, delicious, fresh and surprisingly deep in flavor, this salad works terrific with fish or pork or anything that you choose to make that's either spicy or salty. In the restaurant we had it as an appetizer to spicy chili crab and it was perfect! 1. Peel and cut watermelon and set aside. Slice scallions with green in long thin strips and white thinly sliced on bias and set aside in a small bowl. 2. No more than 2 hours before serving, mix the rice wine vinegar, mirin, sugar and salt in a small bowl. Add the watermelon and toss gently. Let marinate no more no 2 hours. 3. Drain off the pickling juice, reserving at least 1 teaspoon of juice. Let watermelon strain through a sieve or colander. 4. Add watermelon to a bowl, add in scallions. 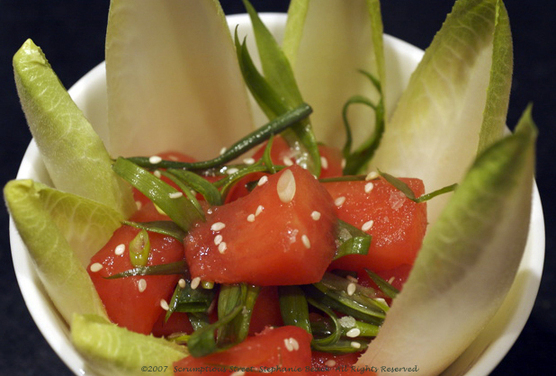 Mix the reserved pickling juice and toasted sesame oil together as a dressing and drizzle over the watermelon salad. Gently toss with hands and sprinkle in the sesame seeds. Serve immediately, best at room temperature. For those of you who read my July 4 post, you learned all about the fantastic mustard I recently discovered after eating at the restaurant Moutarde in Brooklyn. I used it to make a wonderful potato salad which will really please your guests and fellow diners. 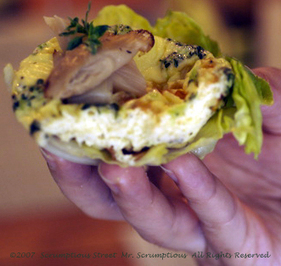 It's similar enough to what most people know that they'll enjoy it, but unique and tasty enough that the foodies in the crowd will go wild with delight. Here is my "Banana-Mustard Potato Salad". And YES!! That is the first of two ripe tomatoes from our beloved Scrumptious heirloom tomato plant. It was a juicy, sweet, and deep-tomato flavor you cannot get from greenhouse tomatoes. BLISS! The plant had more than 36 tomatoes at last count. This thing is flourishing! I like to keep the recipe for potato salad simple: no raw onions, no pickles, no celery. Make it the way you want of course, but you really need to use the banana-mustard at least once to put an amazing twist on your regular recipe. 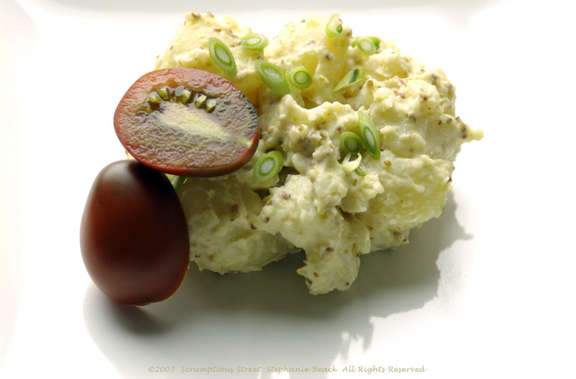 I'm quite sure you'll love it as much as we did here: Mom and Dad Scrumptious, me, Mr. Scrumptious all loved this potato salad! Please try this recipe this summer and let me know what you think! I'd like to hear whether we're the only ones crazy for it. One of my favorite aspects of cooking is the improvisation and when I have fresh simple ingredients on hand, I am always putting a different twist on the classics. My herb garden is growing wonderfully well, just like my tomato plant you all have heard about. It's hard to keep up with the herbs sometimes, we are only two Scrumptious people after all. So, this week I was faced with the realization that I needed to use a large amount of herbs fast, or some would start bolting. What better way to use them and make a light and fresh summer meal than pesto pasta? 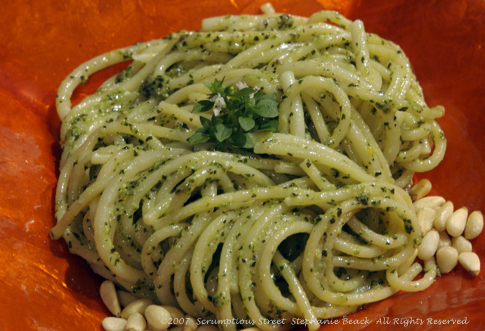 My "Scrumptious Garden Pesto Spaghetti" really hit the spot and helped me use the herbs before they were ruined. I know what a traditional pesto is, and this is not one. But, it is mine, made from a variety of herbs grown from my own hand and care. 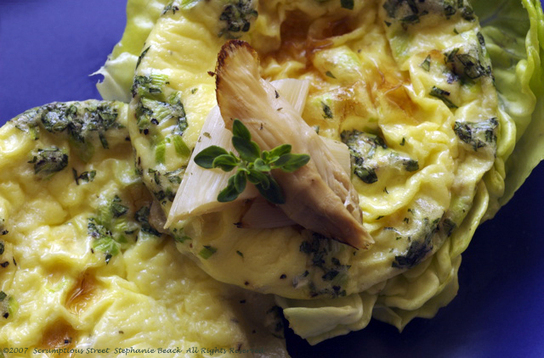 You can use any herbs you like to make a similarly creative and light meal. I really adore the Greek bush basil, it makes such an intense and bold flavor, with aromas of anise and warm spices in the leaves. Also, this is the first I'd tried chives in a pesto and it was a wonderful addition with the gentle onion flavor. 1. Bring a large pot of water to rolling boil. Add kosher salt to the water and the pasta, making sure all is covered. Reduce heat to medium-high and cook until al dente, 8-10 minutes. 2. In a food processor, add the pine nuts, garlic and parmigiano-reggiano. Pulse until it's a chunky, crumbly consistency. Add the fresh herbs and run until it's a thick paste. Slowly drizzle in the olive oil until the paste smooths out and becomes like a thick sauce. Season to taste with freshly ground pepper. 3. When pasta is done, turn off burner, drain pasta and quickly return it back to the pan. Pour in the pesto slowly and toss with tongs. You will likely not use all the pesto, just pour and toss a bit at a time until you get a coverage you like. Plate immediately and serve.